Today, I shall be comparing two sandwiches. Both describe themselves as chicken and bacon sandwiches - however, they are from different shops, and made by different companies. How different can they be? Chicken breast and smoke flavour sweet cure bacon with mayonnaise on malted bread. 30% less fat than Morrison's standard chicken and bacon sandwich. My first impressions of this sandwich were very favourable. Being a "low-fat" sandwich, I was expecting eating it to be quite a bland, uninteresting experience - I am pleased to say, however, that this was not the case! Despite its attempt to be "healthy", this sandwich was still flavourful and enjoyable. The chicken wasn't dry, and it combined with the bacon to make an excellent tasting filling overall. There were a few small niggles with this sandwich. The bacon, when tasted on its own (a piece fell out of the sandwich as I was eating it, so I had a chance to eat it separate from the other ingredients) had a slightly burnt flavour - I'm all for bacon being "smoky" (as this sandwich claims its bacon to be) but I think there has to be a distinction between "smoked" and "burnt", and this bacon, unfortunately, erred on the side of the latter. When combined with the chicken, bread and mayonnaise, this was barely noticeable, and so it is not an issue that effects whether or not I would buy this sandwich again, however I felt it was worth a mention. The only other negative thing I would have to say about this sandwich is purely a presentation issue. The packaging is an entirely plastic carton - acceptable in the '90s, perhaps, but less and less so these days - and there were one or two blemishes on the meat in the filling. None of these things affects the taste of the sandwich, nor enjoyment one gets from eating it, though, so I don't count them as problems with the sandwich. The sandwich with which I shall be comparing the Morrison's Eat Smart sandwich is a Deli Club Chicken and Bacon Triple. Chicken and bacon mayonnaise on malted brown bread. The combination of the shredded meats with the extraordinary amounts of mayonnaise give this sandwich a strange, squelchy texture (which is really rather unpleasant) and also serves to remove any serious flavour which may have been in the ingredients to begin with. If given this sandwich in a blind tasting, I would be hard-pressed to decided whether I was eating a chicken mayonnaise sandwich or a tuna mayonnaise sandwich - and the idea that there might be bacon in it would not even enter my mind. This sandwich scores more highly than the Morrison's version on its packaging, coming in a much more modern, cardboard packet. The designer of this packaging, however, can't have had much of eye for detail, as he failed to notice that the graphics on the back of the sandwich packet were actually upside-down! See? Overall, my comparison concludes in favour of the Morrison's Eat Smart sandwich on almost all counts. 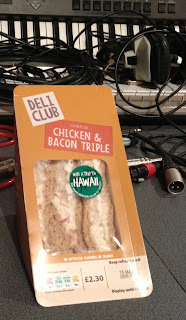 The Deli Club Triple was not enjoyable to eat, and certainly didn't taste like a Chicken and Bacon sandwich should, while the Morrison's Eat Smart surprised me with its value for money, and better-than-expected general flavour and enjoyment. 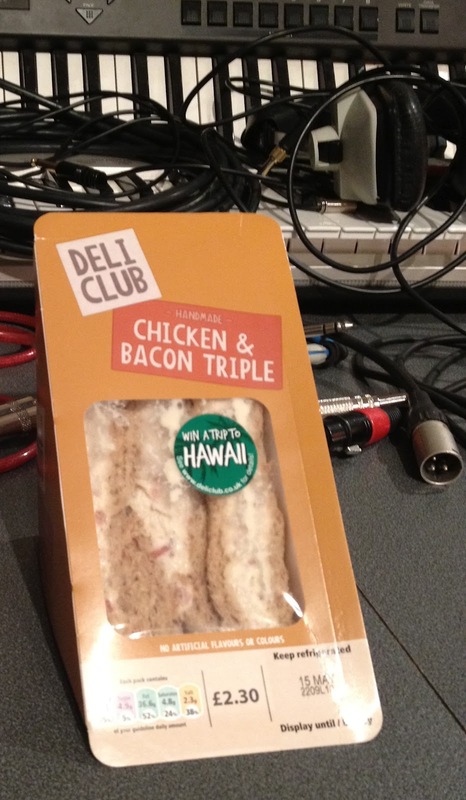 The Morrison's sandwich, I would buy again; the Deli Club Triple? Not a chance! My thanks go to Alex Demetriou for assisting with research and analysis during the writing of this review. "My pleasure, Kit" - Alex Demetriou, chief sandwich quality control for Regal House. At present, very few people know what is behind this surprise move. It is hard to imagine a player wanting to leave a club whose profile has been raised almost beyond recognition in the past few years - a club where he has been the top scorer for three consecutive seasons, and where he is adored (idolised, even?) by the fans and players alike. For these reasons, it's hard to make any kind of judgements about this bizarre situations - and it would certainly be advisable not to jump to any conclusions. What worries me most of all, though, is some of the comments from Norwich "fans" about this situation, which are now emerging on Twitter and on Facebook. I am shocked at how quick some people have been to turn on Holt, and at the vitriol of some of the comments directed towards him. Personally, I would urge Norwich fans to show some restraint. Nobody understands this sudden move, and I am just as saddened by it as the next Canaries fan - believe me! - but are we showing ourselves, and our club, in the best light by such tribalism? This is clearly a very strange sequence of events. I hope very much that Holt will stay. He has been a huge part of Norwich City Football Club for the last couple of seasons, and I would love to see that continue. Some of these comments are hardly the kind of talk that's likely to make someone want to stick around, though, are they? These past few years have been amazing for all of us. This has been a fantastic time to be a Norwich City fan; back-to-back promotions, followed by Premier League survival, has been the stuff of dreams. We have surprised and impressed everyone with our performance in Premiership this season, and have raised the profile and reputation of our club almost immeasurably - surely the worst thing we can do is to undermine all that hard work now, by having a little temper-tantrum over this Transfer Request business? Having impressed the world of English Football so favourably over the past few months, and with a second season in the Premier League to consider already, we can't afford to sour the image of our club by becoming angry and embittered with our top striker, before we're even aware of all the facts. So, although I completely understand the feelings of confusion and hurt that some fans are experiencing right now, I would appeal to their rational side instead; this has been the most incredible season for us, and the success the club has experienced recently has been fully deserved - please, please don't spoil all that now! British sweetcure streaky bacon with vine ripened tomato, slow roast tomato mayonnaise and salad leaves on malted wholegrain bread. I enjoyed this sandwich. To name it "the best" is perhaps a little presumptuous - but the overstated moniker aside, it was a triumph of taste and flavour; the bacon was succulent and flavoursome, and the salad crisp and fresh. What I was most impressed with, though, was the "slow roast tomato mayonnaise" - this dressing was, in all honesty, the highlight of the sandwich for me. Although the addition of roasted tomatoes into the mayonnaise gave it a flavour of its own, this managed not to take anything away from the balance between the main components of the sandwich filling, but instead added to the overall combination of tastes. It has long been my opinion that dressings can make or break a salad - both in terms of taste (too bland) and texture (too greasy, too runny, etc.) - but this dressing has certainly made the sandwich for me. However, despite having enjoyed the sandwich, I had a few gripes with the way it was packaged. Ostensibly, there is nothing wrong with the green cardboard box the sandwich comes it, nor the little window of clear plastic that lets you see what you'll shortly be devouring - but sadly, this packaging ended up really irritating me. Once you have split the package down the middle, and opened it slightly with your hands, the two halves of the sandwich contained within divide, and start to lean over in opposite directions. The result of this is that they end up "hiding" from you, inside the two bits of cardboard which are left once the middle strip has been removed, and are consequently very difficult to get at. This is obviously quite an annoyance, and is made even more so by the fact that, once you can actually get to it, this sandwich is very tasty indeed. In conclusion, therefore, I would certainly be tempted to buy this sandwich again. I very much enjoyed eating it, and would be happy for it to be a staple part of my diet. I would hope, however, that the packaging is soon redesigned, as the idea of having to grapple with that every time I fancy a delicious BLT from my local Morrison's is not a very savoury one. Tandoori chicken, tomato, yogurt and mint dressing, red peppers and coriander on malted brown bread. It sounds like a good recipe, and I had high hopes for this sandwich. Sadly, though, I was disappointed. The majority of the ingredients are bland, and devoid of flavour. (I would expect slightly more spice from "tandoori" chicken, and I would hope to taste mint in a "yogurt and mint dressing.) But this lack of interest isn't even the main problem with this sandwich - in fact, it's difficult to discern at all, at first, over the prevalence of the coriander. This sandwich is absolutely stuffed full of coriander, and the result is that it massively overpowers everything - not just the other ingredients in the sandwich, but the taste any food product within a half-mile radius of this sandwich is masked by its all-consuming coriander-y-ness. I'm not saying that I don't like coriander (I do) but this sandwich take the concept of "too much of a good thing" to a whole new level! And once I had fought my way through the dense coriander jungle, and was hoping that the rest of the sandwich, once coriander-free, would provide a good balance of flavours, I was again let down by its blandness. So, on the one hand, too full of coriander for its own good, while on the other being bland and uninteresting, suffice to say I was not impressed by this sandwich, and I shan't be buying it again.